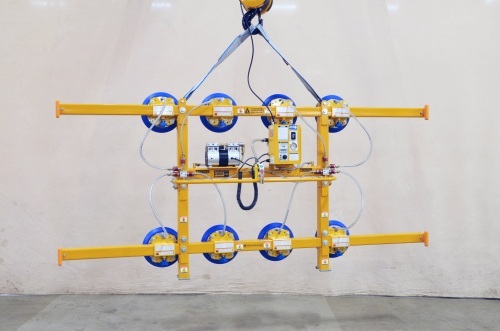 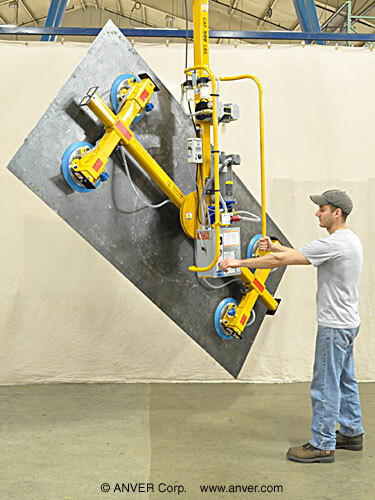 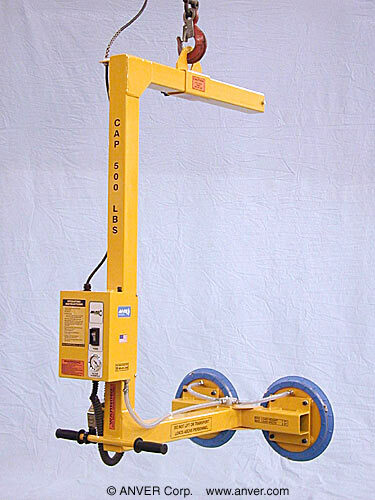 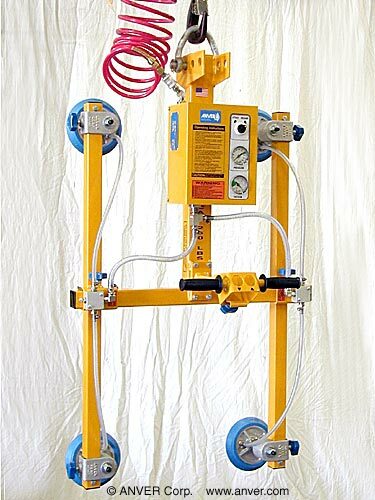 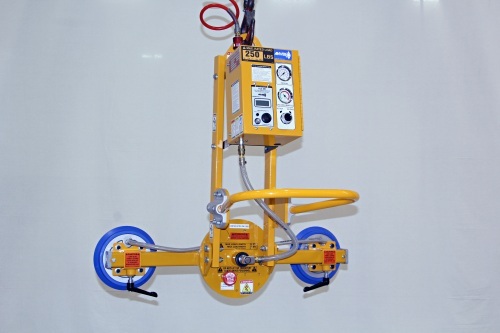 This lightweight Electric-Powered Vertical Vacuum Lifter is designed to significantly reduce the effort of lifting vertical loads while providing powerful suction force. 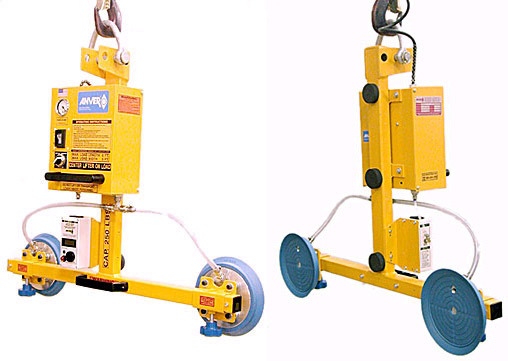 Built with safety in mind, these lifters are loaded with protective features including: a VLS, 9V battery powered vacuum leakage sensor and warning system; an attach/release pendant; and locking knobs on the adjustable vacuum pad, slide assemblies. 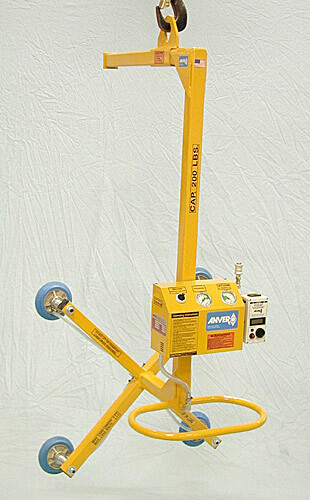 Rated at a maximum vacuum level of 24 in. 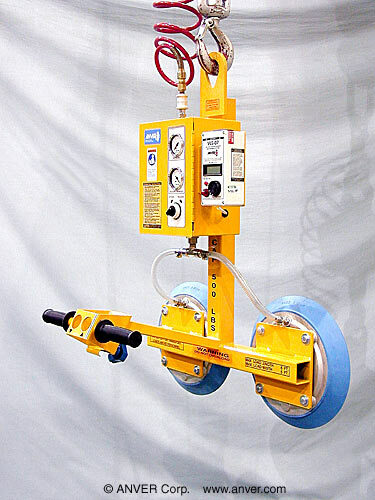 Hg (609.6 mm Hg) at sea level with a 4:1 safety factor on vacuum holding (unless otherwise specified). 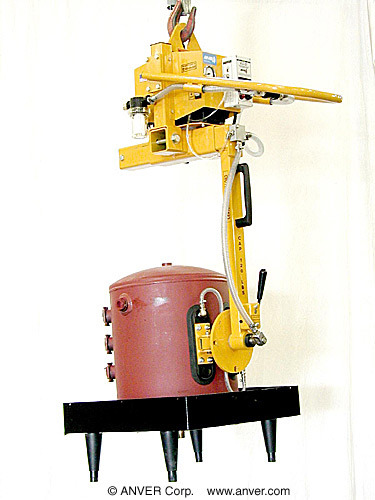 EP1001 vacuum generator with vacuum gauge. 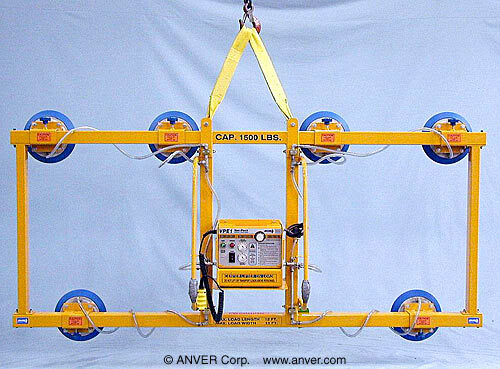 Power required: 115V/60hz/1ph/5A. 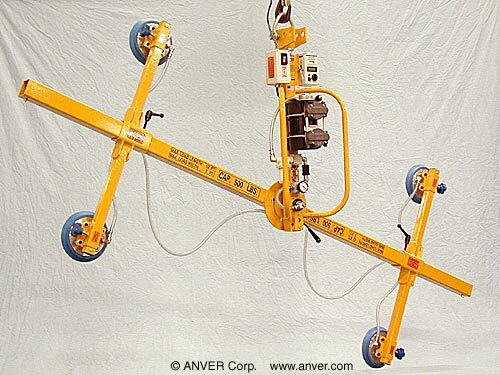 15 amp service required. 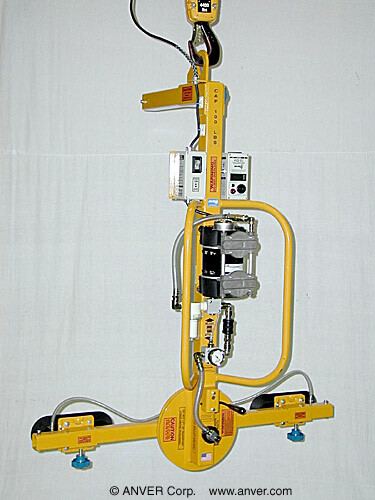 Vacuum pump/motor 4.3 SCFM (121.8 l/min), 1/2 HP; equipped with thermal sensor to prevent overheating and 100% duty cycle. 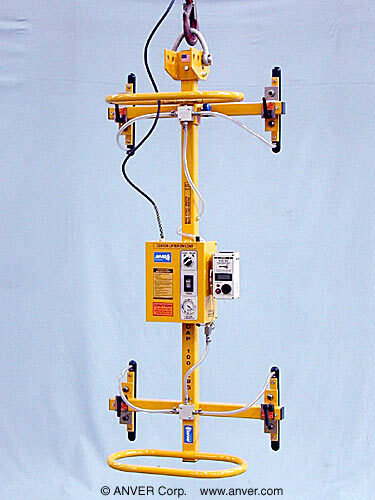 VLS, 9V battery powered vacuum leakage sensor and warning system. 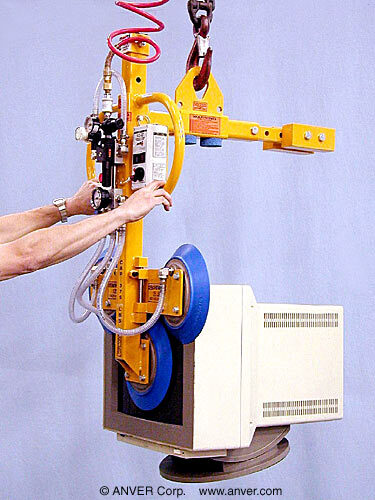 Resettable circuit breaker for vacuum pump. 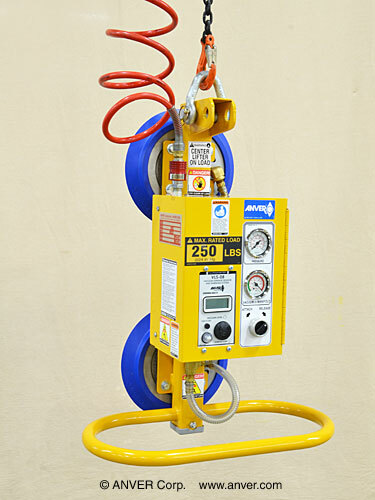 Electrical cord with twist lock, male and female receptacles. 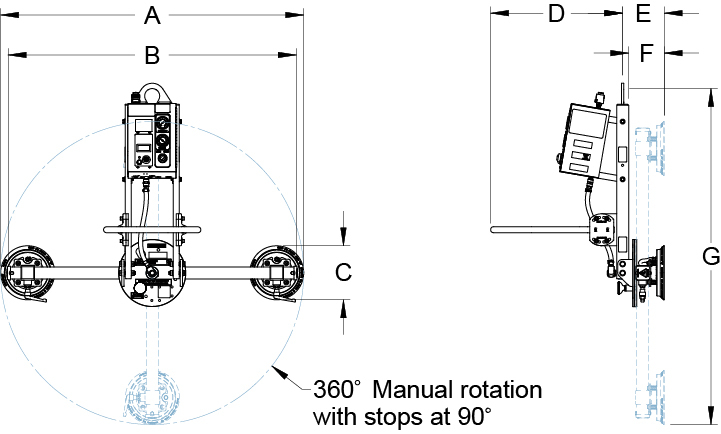 Check valve to halt loss of vacuum in case of electrical power failure. 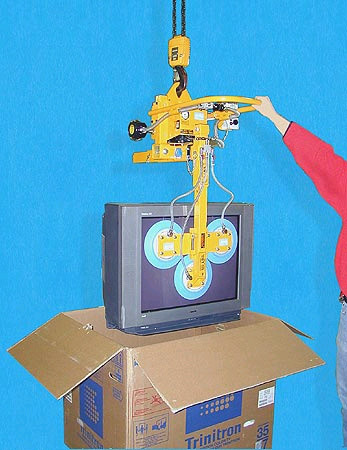 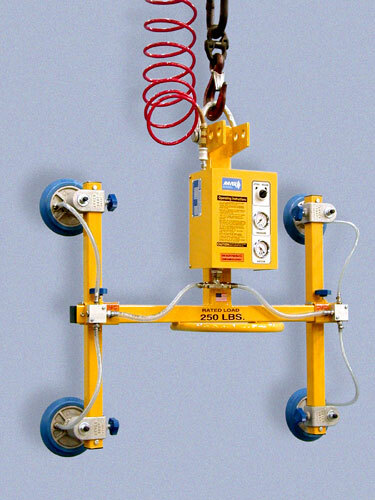 Removeable leg extensions for handling a variety of load sizes. 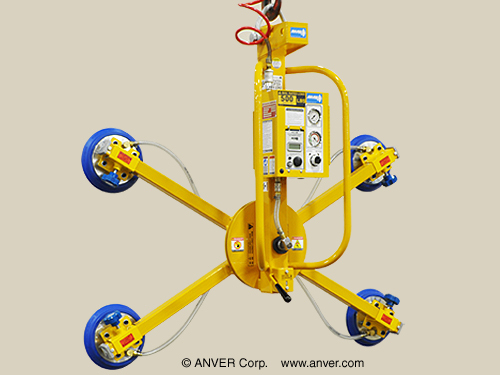 Lifter can be broken down to ship in a smaller package. 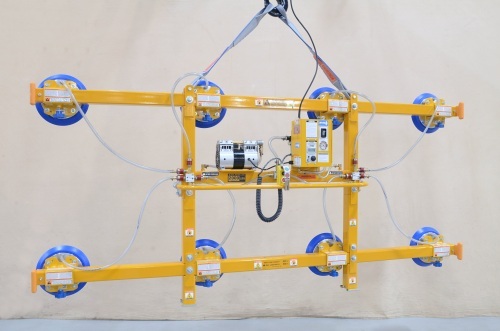 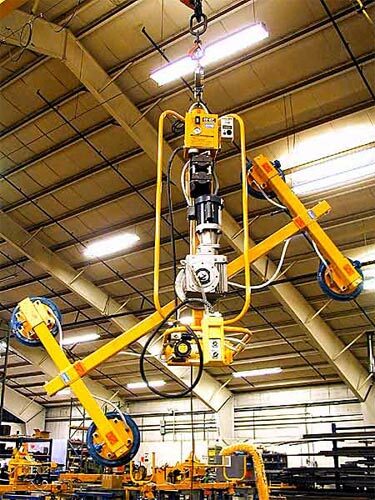 The lightweight Electric-Powered (EVL) and Air-Powered (AVL) Vertical Vacuum Lifters are designed to significantly reduce the effort of lifting vertical loads while providing powerful suction force. 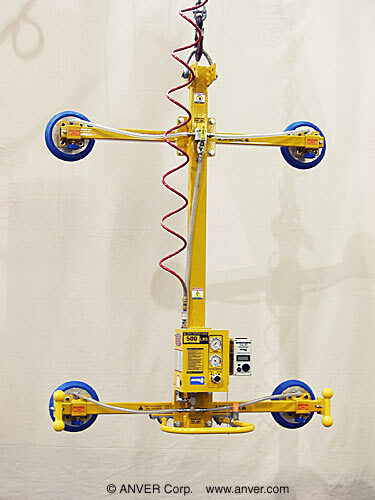 Built with safety in mind, these lifters are loaded with protective features including: a VLS, 9V battery powered vacuum leakage sensor and warning system; an attach/release slide valve with safety lock (EVL-Series Only); and locking knobs on the adjustable vacuum pad, slide assemblies, and crossarms (when applicable). 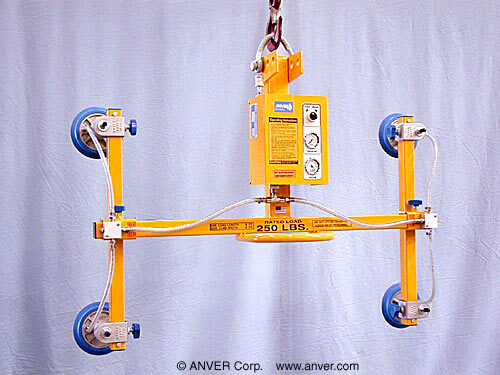 The EVL and AVL Series Lifters are capacity rated at a maximum vacuum level of 24 in. 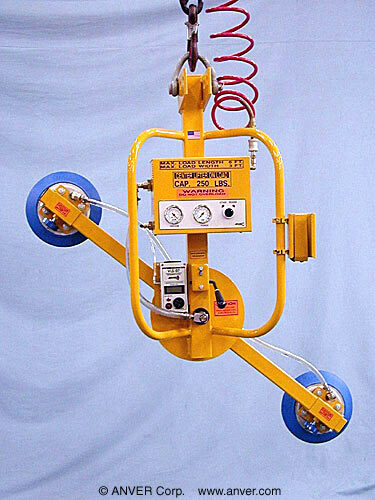 Hg (609.6 mm Hg) at sea level with a 4:1 safety factor on vacuum holding (unless otherwise specified). 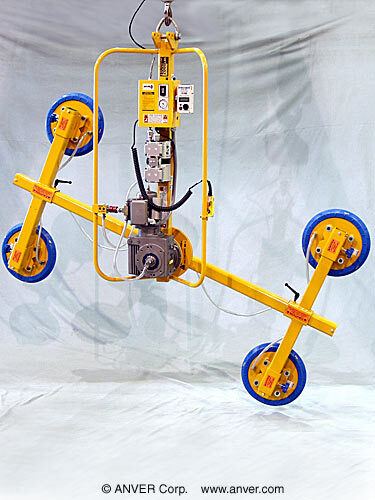 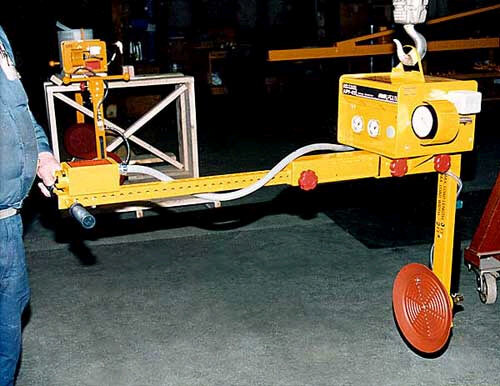 Constructed with an ergonomic lifter handlebar and welded steel lifting frame, operators can use this equipment with ease and comfort for a wide range of loads and applications. 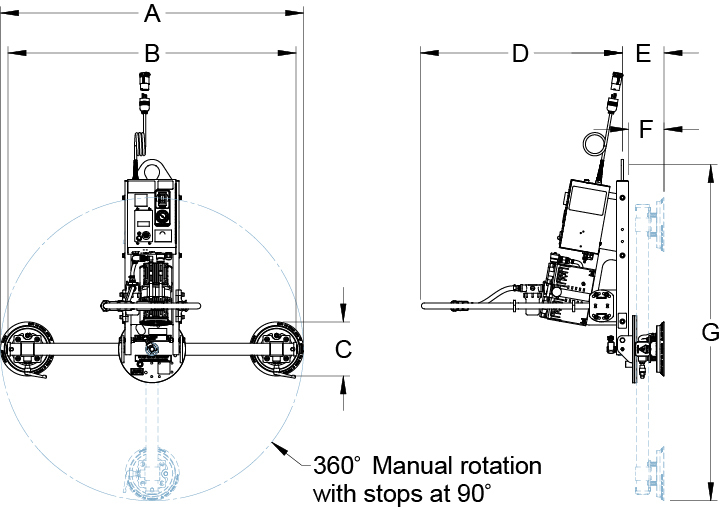 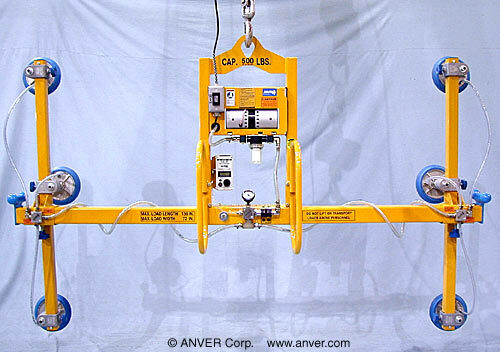 *Load weight and depth affect the final angle that the lifter achieves. 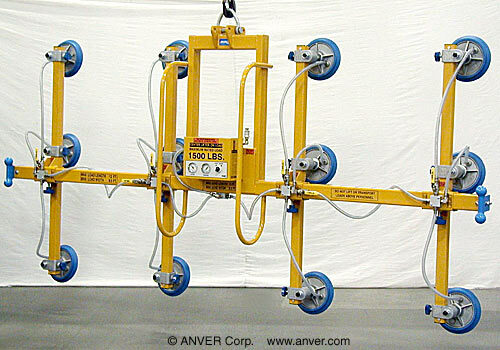 Consult ANVER for loads thicker than 2 in. 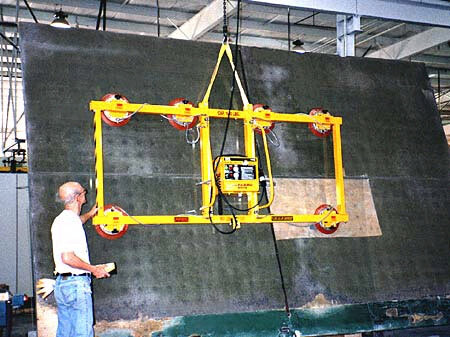 (51mm) due to center of gravity offset. 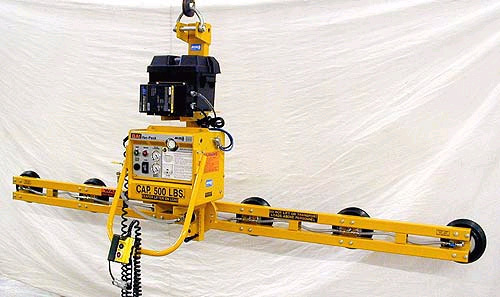 Note: The unit weight does not include optional accessories. 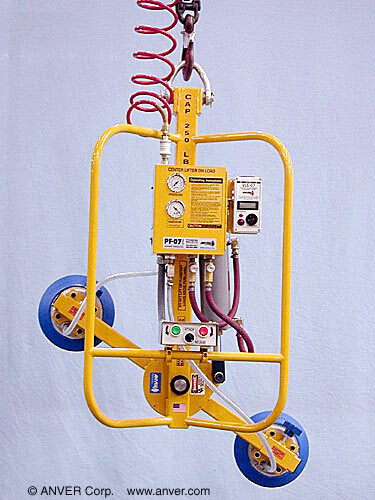 AL1001 vacuum generator with vacuum and pressure gauges and attach/release switch mounted on the enclosure. 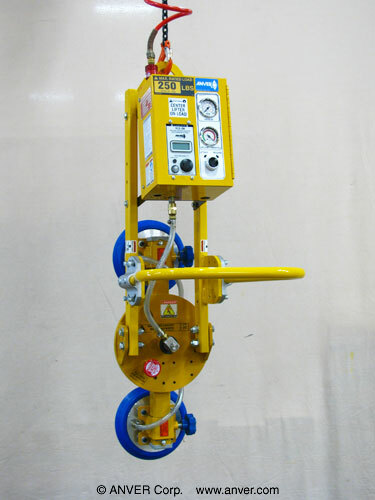 3/8 NPT air inlet with locking slide valve, 100% duty cycle. 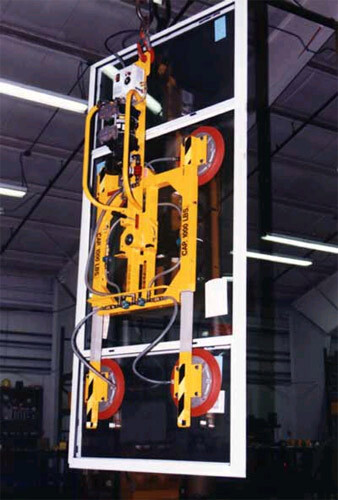 These are quality, U.S. made vacuum lifters that feature rugged construction and quality components designed to load panels off near-vertical racks and onto other near-vertical tables. 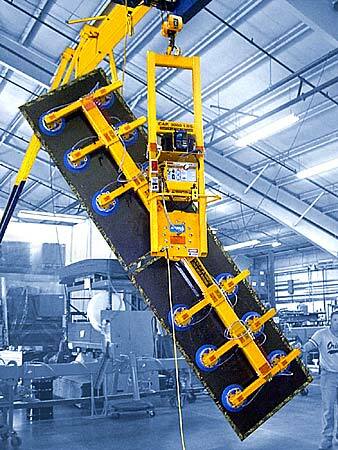 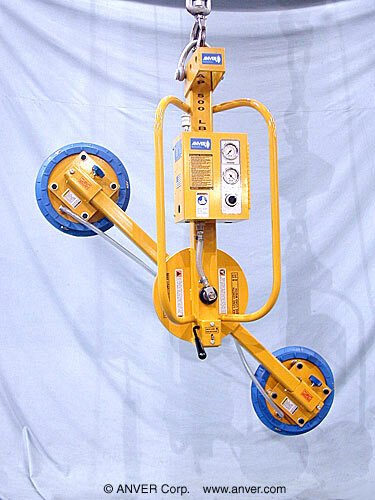 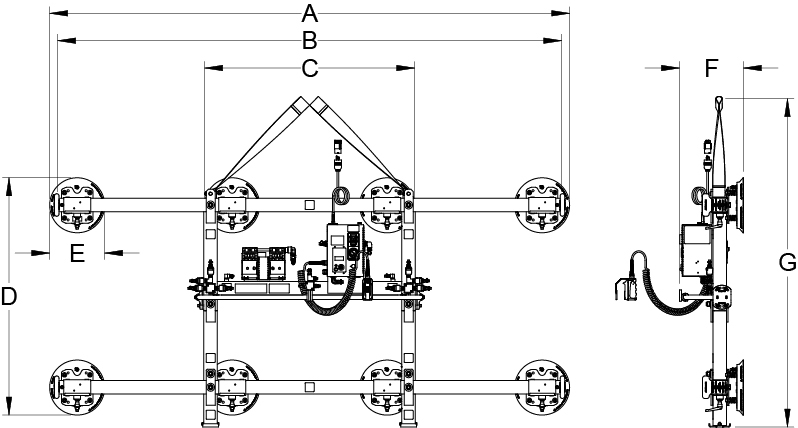 They are similar to standard horizontal lifters, but they are designed to handle upright loads. 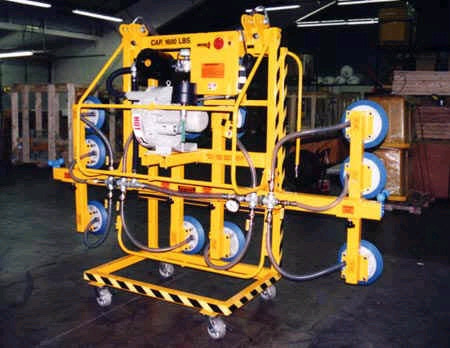 Vertical lifters are designed with a four to one (4 to 1) safety factor on vacuum holding with special non-skid vacuum cups. 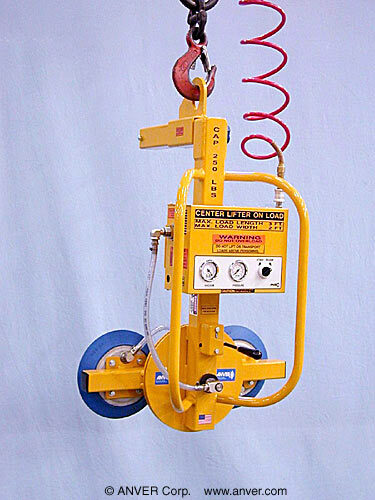 While these vacuum lifters are priced higher than a horizontal vacuum lifter, they are much less expensive than a powered tilter. 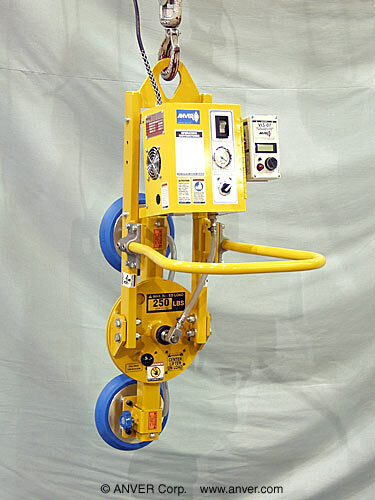 Vertical vacuum lifters offer quick attach and release functionality and offer damage-free handling. 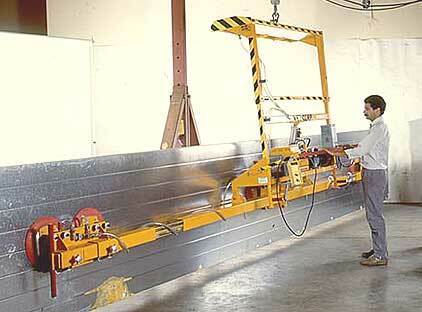 They can be just the handling tool your factory needs. 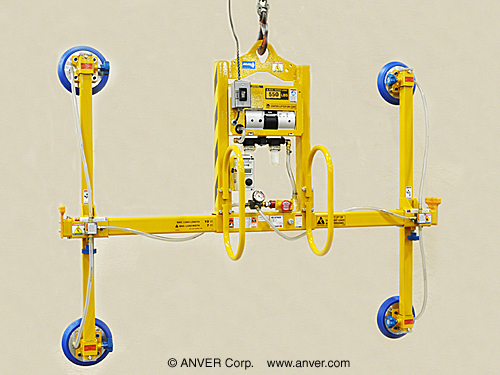 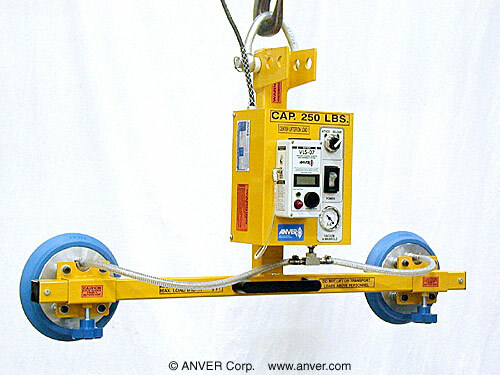 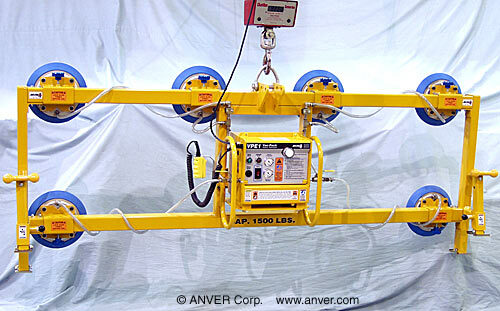 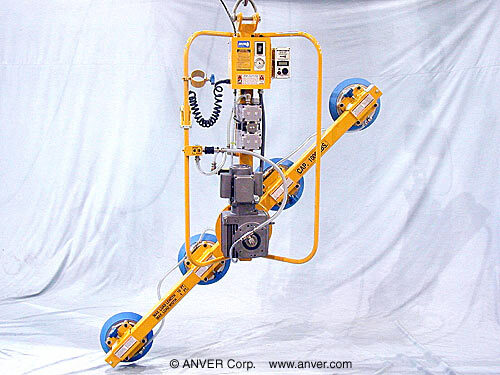 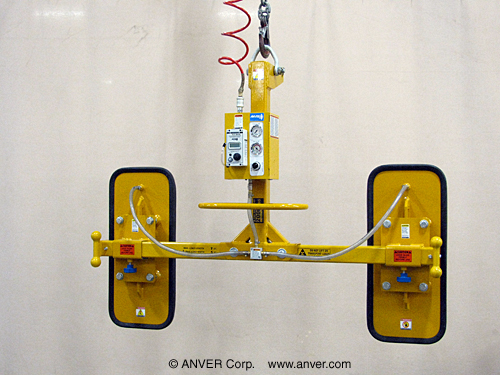 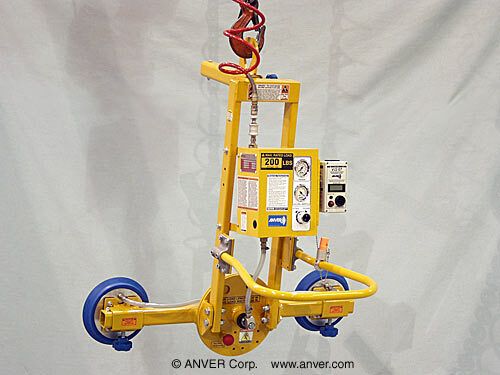 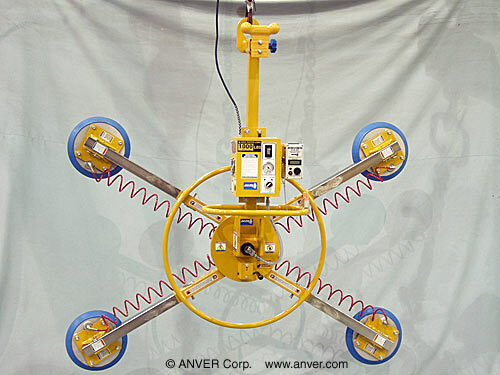 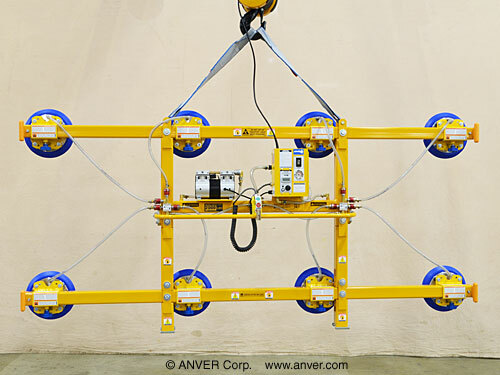 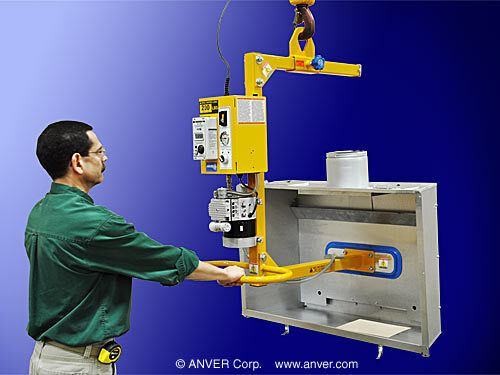 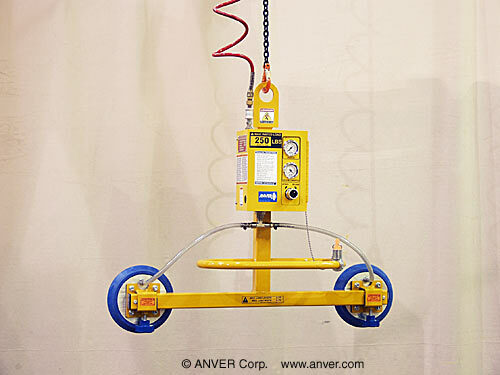 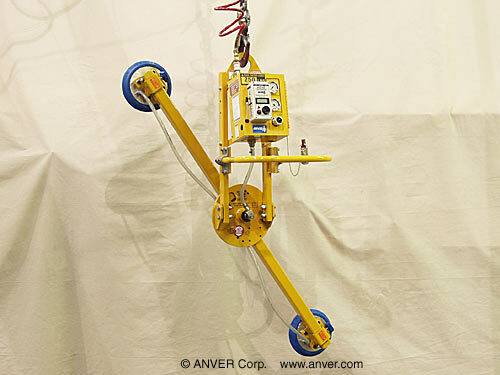 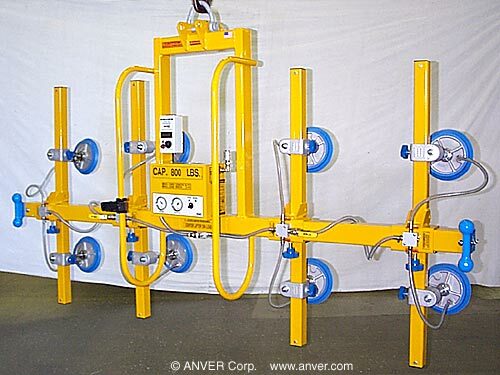 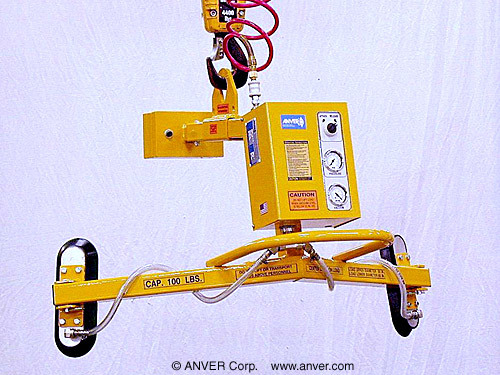 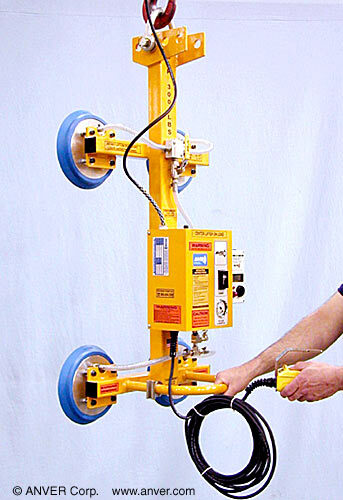 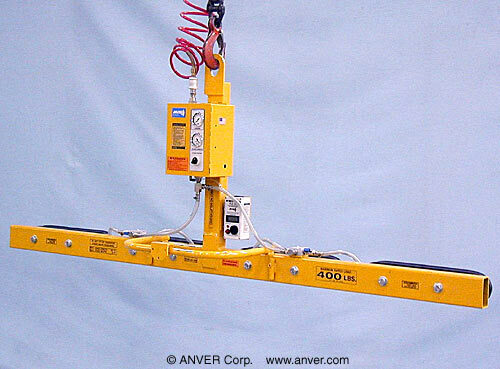 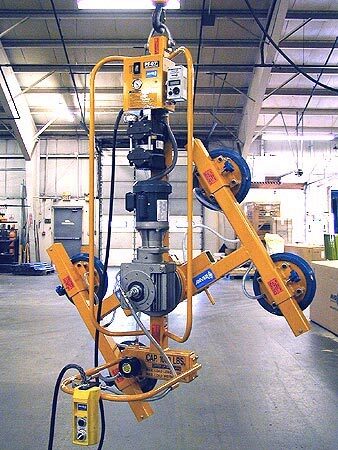 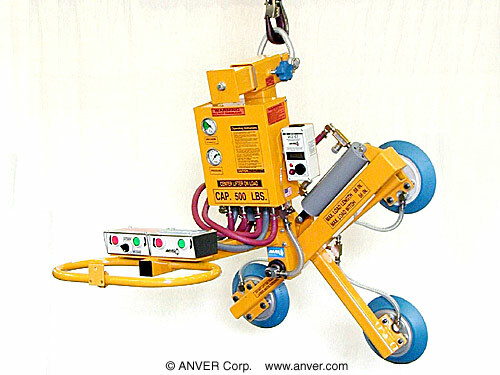 To inquire about custom vertical vacuum lifters, please contact an ANVER Sales Engineer for assistance. 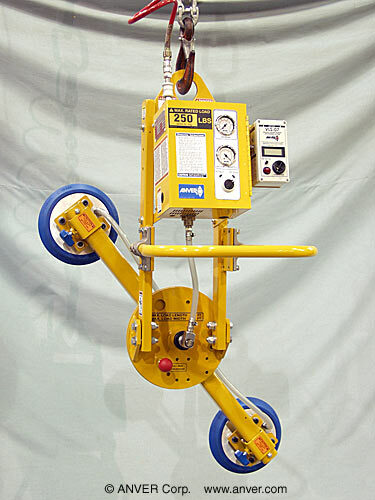 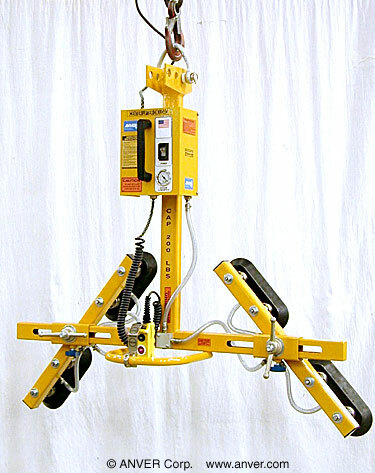 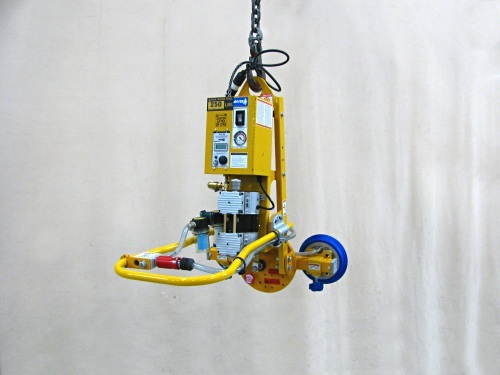 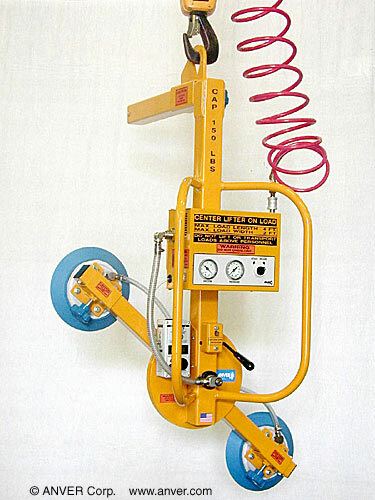 Click on the photos below for more detail about these vertical vacuum lifters. 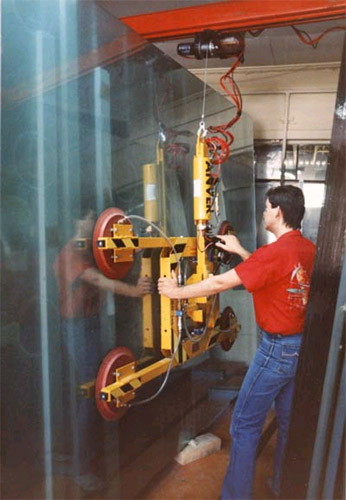 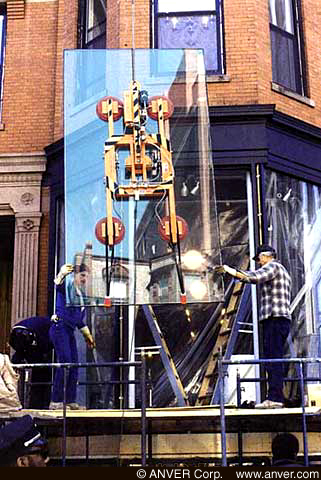 Model #: A20M4-30X30V-C Description: Four Pad Air Powered Vertical Vacuum Lifter with Special “C” Frame Application: Curved Glass Panels 5 ft x 4 ft (1.5 m x 1.2 m) up to 200 lb (91 kg) Notes:	This unit is typically for taking glass windows and panes in and out of a box container. 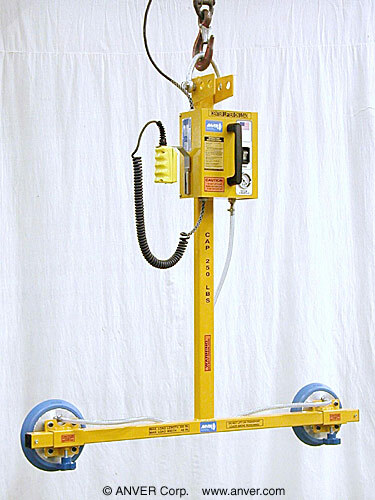 This model is available with Electric, Battery and Air vacuum power. 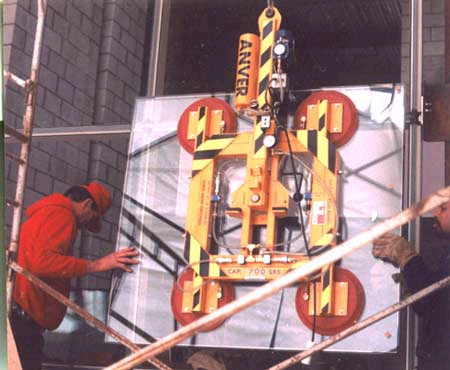 Interesting Features	This unit has a movable bail to adjust to different thickness windows. 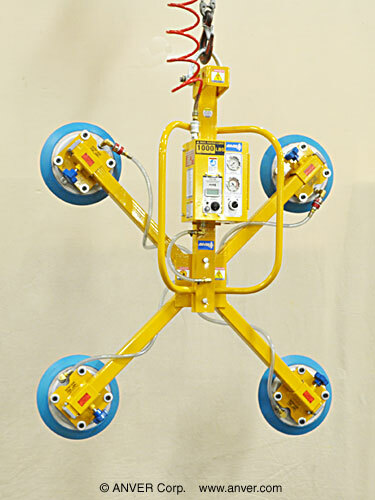 The unit is equipped with an optional VLS Leakage sensor and has virtually instant attach and release.